Day 1 Wrightsville Beach: Sleep in! Then we walked to (you can guess...) West Marine, the grocery store and the hardware store including crossing one of the bridges on the ICW that we didn't have to do (whoo hoo)! Honestly, we don't need much at West Marine anymore. I got out without anything but we did NEED a new clutch for the main traveler. The cashier recommended Bridge Tender for lunch and it was declared the "best meal we've had since we left," by the Captain. I had blackened mahi with brown rice pilaf & a vegetable medley. 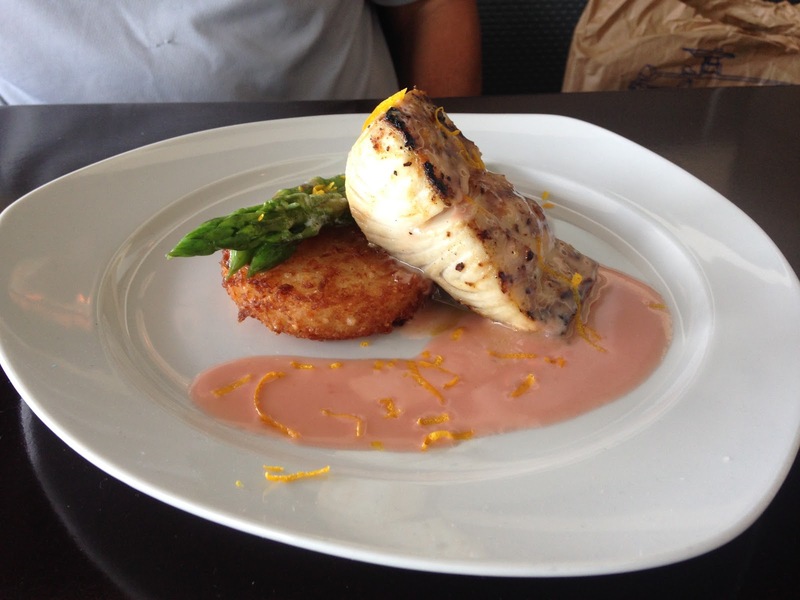 Captain had broiled mahi with asparagus and a fried coconut rice cake he couldn't quit talking about. Gonna have to look up that recipe! The waves are going against us on the dinghy ride back and we got soaked--this was SOP (standard operating practice) for our stay here. 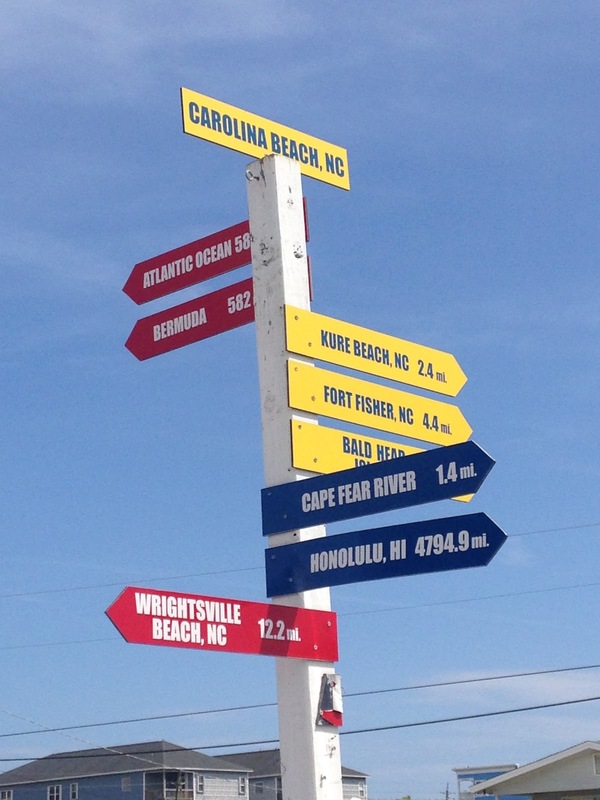 Wrightsville seems like a cool town. We were greeted by fishing boats, power boats pulling skiers, jet skis but also a lot of paddleboards and kayaks. Everyone looked like they were having a good time. Our walk showed an high number of joggers and walkers. Very fitness-oriented. I'd say 1/3 of the people are paddle-boarding or jogging at any one time--and not all young kids either. Excellent stop. A wicked storm passed through this evening. Capt saw 35 kts of wind and we definitely swung closer to the docks. When it's all over, it's impossible to tell if we drug or our neighbor. Actually, I think everyone moved a little bit because there was a 180 wind shift at the beginning. By bedtime, more rain has moved in and we are definitely swinging closer to our neighbor. We elect not to reanchor after dark, so we decide to get up every two hours and check our position (I don't think the Captain slept much). 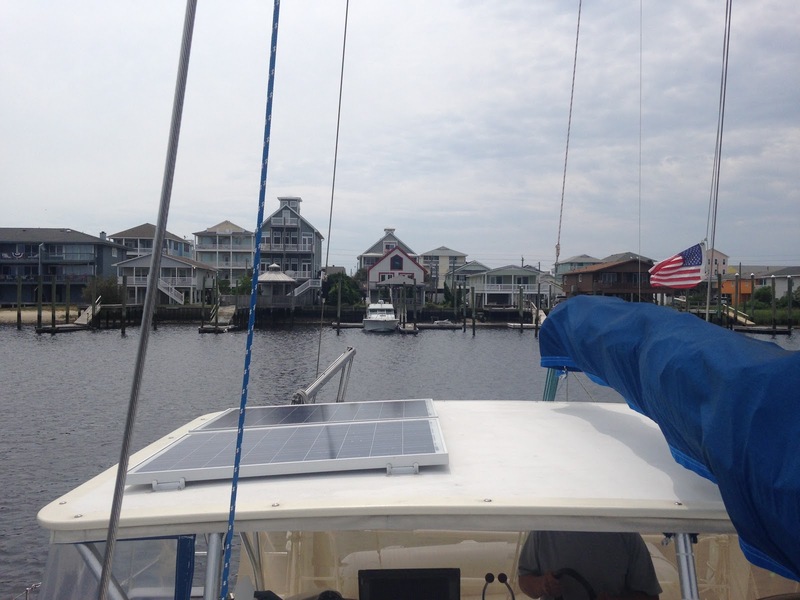 Wrightsville Beach to Carolina Beach: A short motor to reposition closer to Cape Fear. If we see a favorable day, we may do another offshore run (but the long range forecast isn't looking good). There was some shoaling (shallow water) coming out of Motts Cut to join the ICW and it was also low tide. We actually bump once. We will have to start paying attention to low tide from here on out, as we near South Carolina and Georgia. Carolina Beach is one of the biggest vacation towns in the area and also has a mooring field (unusual in the US but common in other areas). 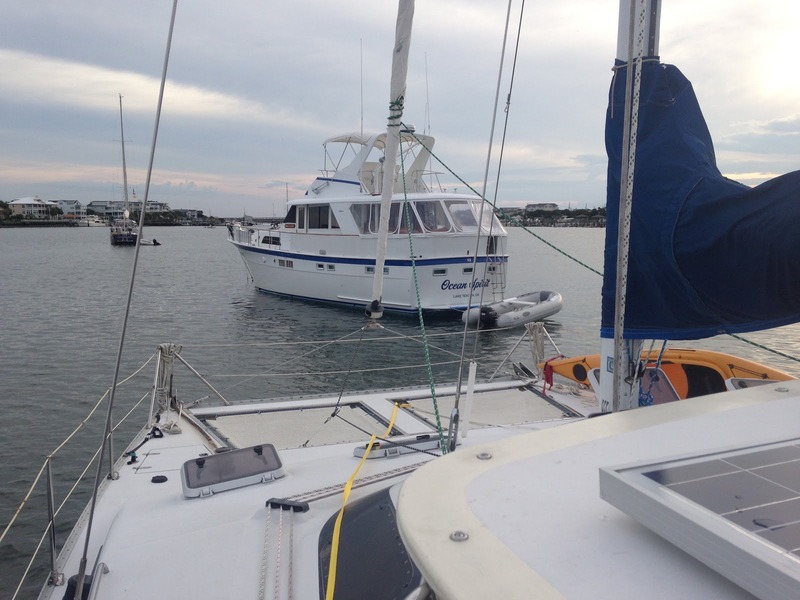 We paid $20/day (not free) but we don't have to worry about the anchor dragging (Captain sleeps good!) or other boats dragging into us (technically). We're in another great pelican watching spot. They apparently fish in the late afternoon, and the Captain studies their technique. High pass. Low pass. 180 dive with a HUGE splash. If they catch a fish, they sit in the water. If they don't, they immediately take off again and do another pass. Tried to get a video but none of them would cooperate. Dinner is grilled hot dogs & potato salad. The Harbor Master shows up to collect our money & give us more info. It turns out we are right next to the second town dinghy dock that will take us straight to the beach. It's supposed to be in the 90's this week. We may dig out the bathing suits! Day 2 Carolina Beach: We crank up the generator and the espresso machine ("to top up the batteries") and head out into the cockpit. Is that an ALLIGATOR? "Just a little one." And he's heading for the dinghy dock. He's waiting for me to get in the kayak. I can tell. "Just bop him on the head with your paddle." You're not helping. Later I get brave and kayak over to check out the closer dinghy dock that leads to the beach (gator, gator, gator.) There is an afternoon run to McDonald's for internet and ice cream. Chicken is grilled. It's Thursday, so we watch the downtown fireworks from the trampolines out on the bow. Day 3: We decide to dinghy into McDonald's for some wifi and get caught in a downpour. Well now we don't need showers! It's laundry day (the first time dinghying into a marina with the dirty laundry) so the Captain dropped me off, came back and picked up the first load and brought me and snack, then back to the boat and returned when I was done. There's a shower in the laundry room which is handy--two birds. One stone. I heard some whining about how much work it is to open and close hatches as the rain showers moved through on a hot day. "Yep, that's what the first mate does when they aren't doing laundry." That's annoying. The Captain finds something to take apart (autopilot wheel & servo) then back into town for an excellent dinner at the Indian restaurant. It doesn't look like we are going to get a weather window to go outside this week, so we stow the kayak and dinghy and plan for a 50 mile run through Cape Fear River (sounds fun!) and down the ICW. Charleston here we come.